By day, Matthew Murdock is a New York lawyer, fighting for the underprivileged and unheard voices of Hell’s Kitchen. By night, Matthew Murdock becomes Daredevil, a hero whose enhanced senses are so keen that he capable of deflecting a bullet in 17 milliseconds even though he’s completely blind. Not much can sneak past his super-hearing or his incredible radar sense, so to be a criminal in Hell’s Kitchen, you’ve got to be one of the best. In this list, we’ll get to know Daredevil’s own rogues gallery a bit better. The hand has five fingers, each of which can exist independently of others. Not unlike the five islands that form Japan. However, when the five fingers of the hand come together for a single, unified purpose… the hand becomes an object of unwavering power! We’re starting with the Hand, an evil ninja organization, because nearly every person in Daredevil’s rogues gallery is or has been a member of the Hand. Even Daredevil himself once led the Hand, though they were only using him since he was powerful enough to be a vessel for a demon that they worship. The Hand was founded in the year 800, when members of Japan’s feudal class chose to fight back against the oppressive class system. For a long while, the Hand fought for the underdogs and against evil emperors. But over time, they became obsessed with power. Children were taught to be ninjas from the day that they were born, learning games that mimicked camouflage, evasion, and unarmed combat. Members of the Hand practice ancient and evil magic, often to bring their leaders or soldiers back from the dead. Only Daredevil has been able to truly defeat them in the past. 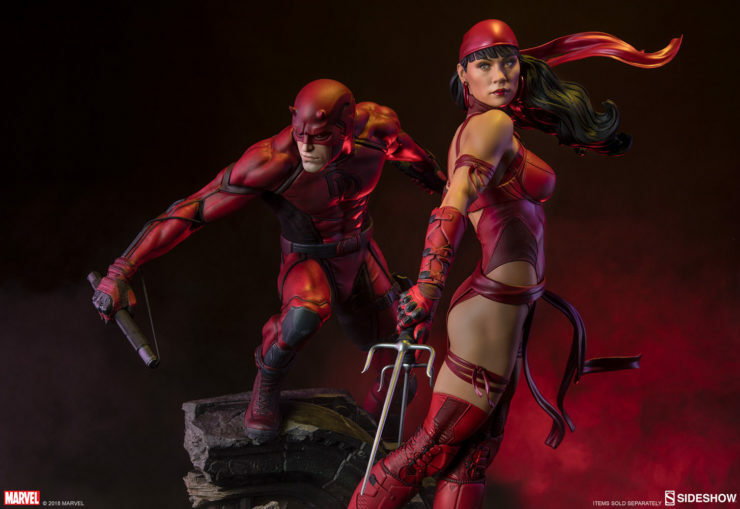 Elektra Natchios is one of Daredevil’s greatest foes. She’s also one of his greatest loves, which makes her all the more deadly. She has been a leader of the Hand and has worked against nearly every hero and villain that she’s ever allied with. In one story arc, she gives Kingpin all of the evidence he needs to blackmail Daredevil and reveal his secret identity. In a following arc, she works with Daredevil to defeat Kingpin and destroy all of the evidence she gave him. She’s unpredictable. She’s unexpected. Daredevil never knows if he can trust her. And if it wasn’t difficult enough, she has low-level telepathy powers that can be used in a myriad of ways. She’s switched minds with people, and even borrowed their minds to complete her bidding. She can hypnotize people and make them see illusions. She has telekinetic and telepathic abilities and can even sometimes see the future. Worst of all, she can overwhelm Daredevil with a Chi based scream that could disorient or even kill the man without fear if used properly. Leland Owlsley was once nothing more than a Wall Street banker. He fudged the numbers in his favor without ever getting caught—for a while. When he did get caught, he fled to a hideout and planned his next claim to wealth. He decided that he would defeat Daredevil in front of all his other enemies, thus solidifying his rule of the criminal underworld. He subjected himself to intense tests to change his genetic code and give himself the ability to glide over long distances. Over the years, he modified his body and his genetics more and more to become stronger, more agile, more durable, regenerative, and the list goes on. What makes him so terrifying is that he will do anything to succeed. He’ll change anything about his body or his mind just to get closer to his goal of finally defeating Daredevil. 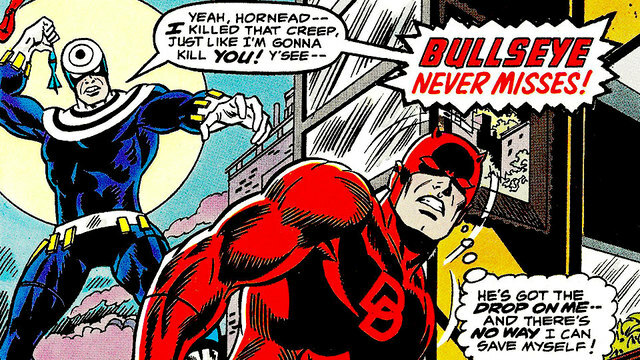 No one actually knows what Bullseye’s real name is, and he’s not keen on sharing it. He’s gone by Lester Poindexter, or Nate, or even Benjamin. He’s a compulsive liar and is absolutely insane. 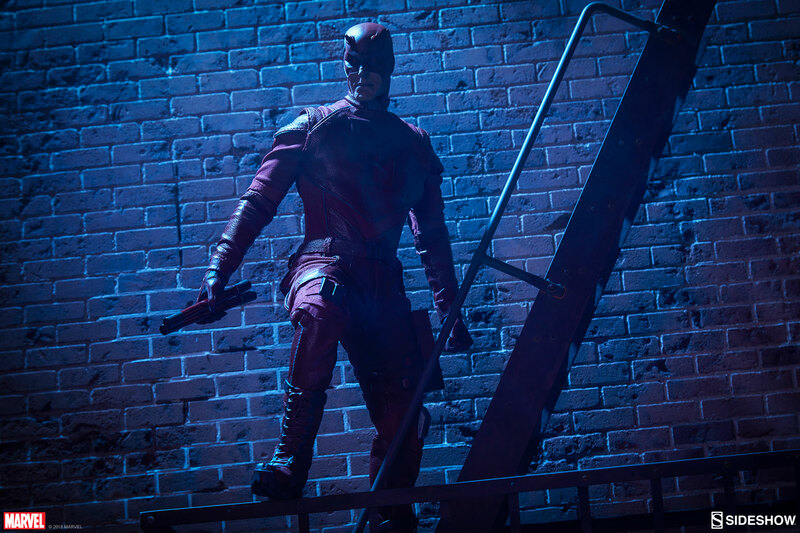 He’ll go to any lengths to defeat who he believes to be his greatest enemy and most worthy opponent: Daredevil. And he has! He’s bested Daredevil in battle a variety of times. Bullseye has the ability of perfect accuracy. He’ll use anything and everything as a weapon. He’s used an apple, ashtray, bolts, books, bricks, CDs, change, a coffeepot, cross, flashlight, food trays, forks, garbage, glass shards, golf balls, hairbrushes, a hubcap, lamp, lid, menu, microphone/boom, paper airplanes, paper clips, pencils, pens, a pill, pipes, playing cards, a plastic baby, potted plant, purse strap, rope, rosary beads, rosin-filled bag, scalpel, shovel, straw, syringe, toothpick, ten pins, vases, and even his own teeth. And he never misses a target. Wilson Fisk is known as the Kingpin of Crime in New York. He has quite a few different origin stories, but they all follow the same themes. Wilson Fisk grew up being bullied by all his peers simply because he was a bit on the heavier side. He drew away from other people and focused all of his energy into body building and education. He became an astonishingly clever and wealthy business man, as well as a pinnacle of human strength. As a legitimate businessman, the government has never been able to hold him accountable for his crimes, even though they’re aware of them. As a criminal mastermind, he is able to cover his trail, and consistently hire other villains to do his bidding. He will never get his hands dirty if he doesn’t have to. He’s hired Bullseye, Elektra, and more. But a fight with Wilson Fisk will not be an easy one. He weighs 450 pounds, and it’s said that he only has 2% body fat. He may have no superhuman abilities, but he’s thrown Daredevil around like a rag doll! Mary Walker has dissociative identity disorder and has three unique and interesting personalities. Mary, her main personality, is calm and quiet, never causing any trouble. She has even been in a relationship with Matt Murdock, Daredevil himself. Daredevil hardly recognized her when her second personality took over. “Typhoid” is the violent and lustful personality, who started a relationship with Kingpin just to spite Matt Murdock. Her last personality is “Bloody Mary” who is a murder machine. Since all of her personalities are so dramatically different, even Daredevil’s enhanced senses can hardly recognize that each personality is the same woman. 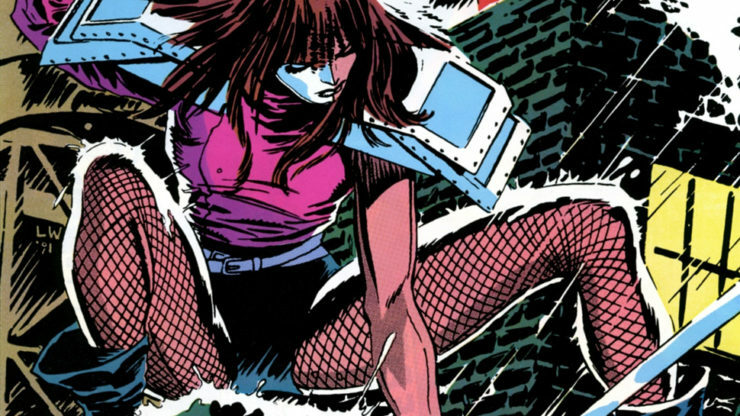 Typhoid Mary uses this confusion to her advantage, due to the change in heart rate, breathing, and even her scent when each personality manifests. On top of all of that, Typhoid and Bloody Mary have access to her mutant abilities of pyrokinesis, telekinesis, and telepathy. She can always catch Daredevil by surprise. Zebediah Killgrave, or the Purple Man, has the ability to bend the will of anyone who hears him and command them to do anything that he wants thanks to pheromones produced by his body. He’s had full and complete control of heroes even as powerful as Jessica Jones. He’s controlled Iron Man. He’s led legions and armies with just his voice alone. 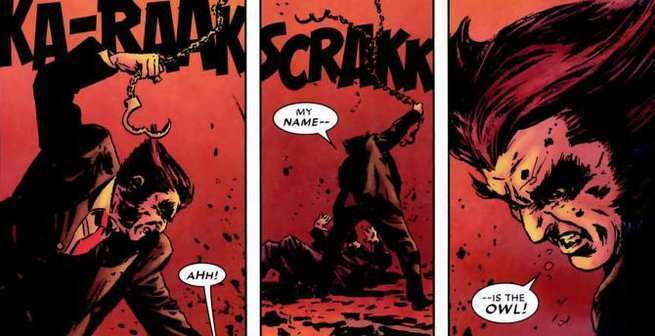 But here’s the twist: Daredevil’s willpower is too strong, and the Purple Man can’t control him. So what makes him a dangerous villain? Well, it’s not about what the Purple Man can do to Daredevil. It’s about what the Purple Man can do to the ones that Daredevil loves. 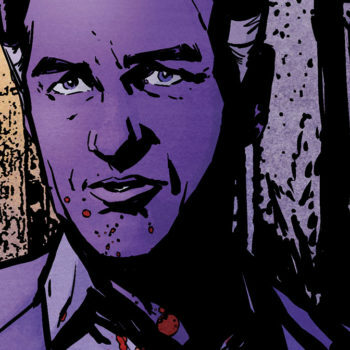 In his introduction, the Purple Man takes control of Karen Page. At the time, Daredevil was in love with Karen Page, and losing her was devastating. 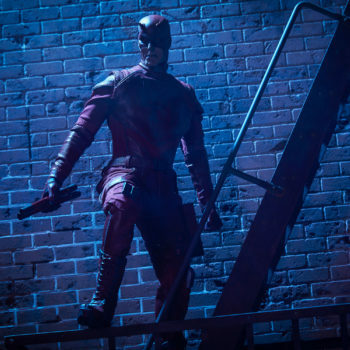 The Purple Man escaped and never even had to fight Daredevil, because he commanded Karen to jump off a building. Daredevil had to save her instead of capturing the villain. It’s that kind of clever and manipulative power that make the Purple Man a truly terrifying baddy. Frank Castle is a complicated character. He doesn’t have any superpowers. He just knows his way around a gun, and he knows how to get what he wants. And all he wants is justice on his terms. He refuses to let people get away with their crimes and will kill anyone who has blood on their hands. He’s considered an antihero, because he’s willing to kill bad guys. However, he’ll never hurt innocents. Daredevil, on the other hand, is not okay with the fact that he kills people. Frank Castle is an expert marksman and could certainly dispatch of Daredevil if he thought Daredevil was evil. But because he knows Daredevil is fighting for good, he’ll never actually hurt him. The Punisher challenges the Daredevil to take the hard road and end the villainy of Hell’s Kitchen once and for all. The Punisher is a moral conundrum that makes Daredevil question all he knows to be true, and all that he thinks is right. Now that you’ve gotten to know these incredible foes of the Man without Fear, take this test and figure out which Daredevil Villain you are! Let Your Geek Sideshow and tell us your result in the comments. 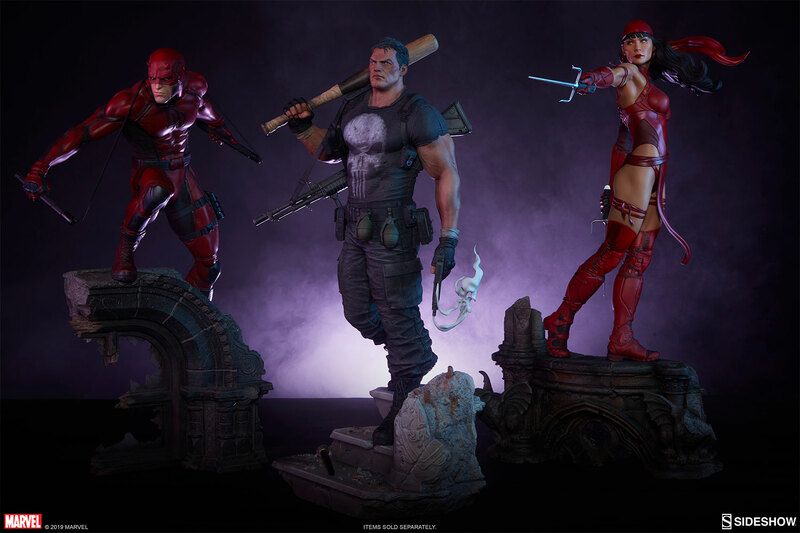 Visit Hell’s Kitchen in your own collection when you browse Sideshow’s full lineup of Marvel collectibles.